This fantastic combo is ideal to entertain kids of all ages. 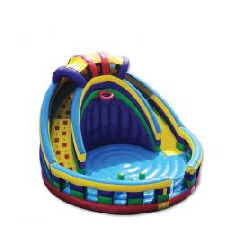 Features circular Climb and Slide, jumping surface, obstacles and basketball hoop. The kids can jump and try their best slam dunk at the same time. Dimensions: 26'L x 23'W x 16'H. Please allow 30'L x 27'W space for adequate clearance.